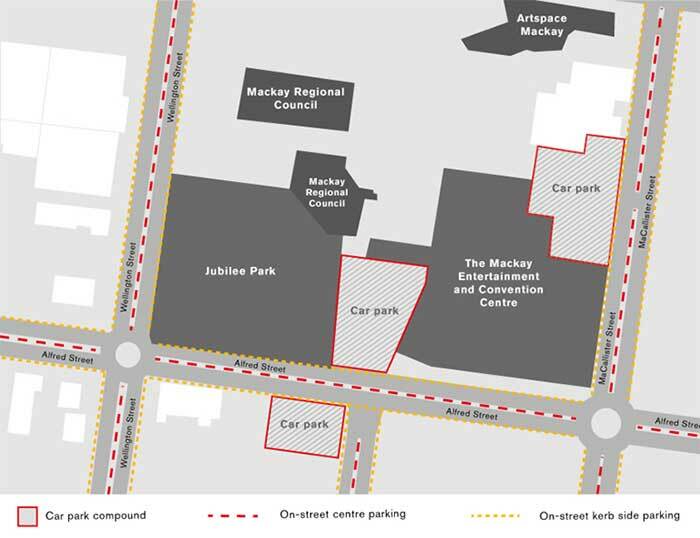 What is the Mackay Entertainment and Convention Centre? The Mackay Entertainment and Convention Centre (MECC) is the largest convention and banqueting facility between Cairns and Brisbane.This state-of-the-art $29 million facility comprises multiple versatile spaces including a 1090-seat auditorium and two plenary halls which, when fully extended, seat 1500 delegates theatre-style or 800 guests banquet style. There are four meeting rooms, a 100-seat studio space, two foyers, a selection of break-out rooms, a dedicated event planner’s office and a registration desk. If you are interested in hiring the venue, find more information here. Where is best to park if visiting the Box Office? The best place to park is in the designated MECC Car Park on Alfred St. There is also ample street parking available on nearby streets, however check parking restrictions. The Box Office is located in the convention centre (just opposite the original entertainment centre part of the building). The Box Office is open from 9am-4:30pm Monday-Friday, 10am-1pm Saturdays and one hour prior to ticketed performances. The box office is closed on public holidays. MECC Tickets is a ticketing services provider that is owned and operated by MECC. Tickets can be purchased by phone, internet as well as in person at the MECC Box Office. The main Box Office is located in our Convention Centre. If you have chosen to collect tickets from the Box Office they will be located here. Tickets being collected at the show will be located in the Convention Centre or Entertainment Centre Box Office, depending on where the show is located. We have one ATM located in our Convention Centre Foyer, just past the Main Box Office. I think I might have left something behind at the MECC? Please contact the Box Office on 4961 9777. Where should I park?The centre has a designated car park that can be accessed via Alfred Street. Ample street parking is also available in nearby streets. Centre patrons must be aware that on street parking includes a mix of restricted and non-restricted parking. Please check sign conditions for the duration of your stay. Two designated disabled parking zones are provided directly on Alfred St. Additional disabled parking is also available on surrounding streets. Parking compounds are also available within five and ten minute walks to the centre entrance. How do I find an event on the MECC website? Go to http://themecc.com.au, click on Tickets or What’s On and select Purchase Tickets (top menu bar). You can search for what you are interested in by searching by keywords, interests or date ranges. You can register online for MECC eNews here to receive the latest updates on new shows, events and special offers. The MECC website provides information of shows on sale and allows you to book online. You can follow us on Facebook or Instagram for updated information on shows as well as Twitter and Youtube. Quarterly What’s On Brochure pick up at the MECC Box Office Call the Box Office on 4961 9777 and speak to one of our friendly staff about what you are interested in and we can let you know what’s coming up. I have signed up to receive MECC emails but I haven’t received any. What should I do? Please contact the MECC Box Office – visit us in person, phone 4961 9777 or by emailing mecctickets@mackay.qld.gov.au. I need an aisle seat, or I have other special seating requirements (eg: wheelchair access, hearing difficulties), or I am bringing a guide dog with me, does it matter? Patron requiring wheelchair allocation cannot be made online. Please phone the Box Office on 4961 9777 to let us know the specific seating arrangements you require and we will endeavour to accommodate your needs and seating requests. An audio loop providing enhanced volume is available in all auditorium seats for patrons wearing a hearing aid with a T Switch. This is also available in the plenary halls on request. If you require the Hearing Loop, please let MECC Box Office staff know by calling 4961 9777. Access to the Companion Card program is only available to Companion Card holders when booking tickets in person, or calling the box office on 4961 9777. The cardholder must provide their Companion Card details when making bookings and present the valid ID card to receive their ticket/s from the Box Office. If you are experience any problems with your online booking please contact us by email or phone the Box Office on 07 4961 9777 ( Mon to Fri, 9 am to 4.30pm & Sat 10 am to 1pm) It’s best if you can let us know the exact problem so we can best resolve it for the future. Yes. When booking online you are able to select your seats by clicking on the choose seats tab. On the seating plan the yellow seats are available to purchase. I wish to purchase a family pass but the option isn’t coming up? Family tickets need to be purchased at capped numbers, so if you are looking at purchasing a Family of 4 - 4 tickets will need to be selected together in order for the family price category to appear. After the price has been selected you can add more tickets to your order. How much time do I have to book ticket online? From the time you click to 'confirm your ticket selection', you will have 15 minutes to complete your transaction before your tickets (and held seats) will be released. Are there concessions or children’s tickets available? Yes, gift vouchers can be purchased online and printed at home or collected in person at the Box Office. They are valid for 12 months from the date of purchase. Gift vouchers can be redeemed online, by phone on 4961 9777 and also in person at the Box Office. How can I make sure I am buying tickets safely online/through the official vendor? We strongly advise you always purchase tickets to any event through the official vendor, which for MECC www.themecc.com.au. We also strongly advise reading through and following the Live Performance Australia Safe Tix Guide and the Guide to Buying and Selling online in the Ticket re-sale market. The MECC recognises that some patrons choose to re-sell their tickets. We discourage this practice, as authenticity is only guaranteed where tickets are purchased directly from the MECC. The Information Privacy Act prohibits the MECC from disclosing patrons' personal information to third parties. Accordingly, the MECC will only discuss specific booking details (including refunds or patron information) with the original ticket purchaser. The re-sale of any tickets at a premium or for commercial purposes without the MECC or the Presenter's prior written consent is a contravention of our conditions of ticket sale. Any ticket sold in contravention may be cancelled without refund and the bearer of the ticket may be denied admission. Any ticket purchase through an unapproved provider is made entirely at the purchaser's own risk. For enquiries please phone the Box Office on 07 4961 9777 or email mecctickets@mackay.qld.gov.au. The MECC Box Office is the official ticketing service for events at the MECC. Any tickets sold through unauthorised sales channels may be seized or cancelled without refund or exchange and the bearer of the ticket may be denied admission. Unauthorised sales channels include Viagogo, eBay and Gumtree. Visit our ticketing terms & conditions page for more information. The MECC accepts payment by major credit cards including American Express, Visa, MasterCard and Bankcard. I’ve put in my credit card details but I have not received a confirmation email. Has my booking gone through? Do not put your credit card number again as you may be charged twice. Call our Box Office straight away on 4961 9777 and the operator can check whether your card has been charged, and if not, they can make the booking for you. Do transaction fees apply to booking? Additional Fees & Charges (Industry Imposed Ticket Charges) as per the Live Performance Australia Ticketing Code of Practice, are applicable. These include charges such as transaction fees, booking fees and credit card surcharges. Please contact the Box Office on 4961 9777 as soon as possible. In most instances we will arrange for a replacement tickets which can be collected from the Box Office on the day of the performance only. The theft of tickets should be reported to the police. Please note: General Admission tickets will not be replaced. Please contact the Box Office on 4961 9777 or email mecctickets@mackay.qld.gov.au. How do I update my MECC contact details? I have purchased tickets for an event and that event has been postponed, what happens now? If the promoter postpones an event, your tickets are valid for the new date/time. If you are unable to attend the new date, there may be limitations set by the promoter as to how refunds will be handled. If you are unable to attend the rescheduled date, and refunds are authorised by the promoter, you will be refunded the full amount paid (including booking fees). We advise you arrive to an event at least half an hour prior to the start time, particularly If you have pre-ordered any catering as this needs to be consumed before entering the theatre. Usually, smart casual dress is perfect - more formal than you would wear to a barbecue, but less than you would wear to a wedding. Because our theatre and plenary halls are air conditioned, you may want to bring a light wrap or jacket. To find out the duration of your event, please call the MECC Box Office the week of the event to receive the most accurate time. Foyer is generally open 60 minutes prior to a performance. Please check your ticket carefully for the correct venue and door. Auditorium: Four entrances, Door 1 and 3 are on ground level, Door 2 and 4 are accessed via the stairs. For non-ticketed events please check for signage. If you are unsure of how to find your door, please ask an usher. The use of photographic or recording equipment is strictly prohibited in the auditorium at all times. Are drinks allowed in the auditorium? Yes, audience members may bring drinks purchased in the venue into the auditorium. Drinks must be in MECC plastic cups, available at all bars and decanting stations. Why are drinks allowed in the auditorium? Feedback showed that our community was ready for this change and the MECC is always looking for ways to make patrons’ experience enjoyable. At which shows can I take my drink into the auditorium? From February 2019 patrons will be able to take drinks into the auditorium. This will apply to all shows in the auditorium. Where do I get a plastic cup from? Cups are available at all bars and decanting stations. The decanting stations are located on the ground level in the North Foyer. What if I purchased a drink in a glass, and wish to take the drink into the auditorium? Glass is not allowed in the auditorium. If you wish to take your drink into the auditorium it will have to be decanted into one of the approved cups. I don’t want my drink served in plastic. Please enjoy your drinks in the foyer before entering the auditorium as glass is not allowed in the auditorium. Is the plastic cup biodegradable? Yes, our 420ml and 200ml cups are biodegradable.